While a small window air conditioner might not provide as much power as bigger units, it is sufficient for one room, small- to medium-sized, of around 200 square feet. These 5000 to 8000 BTU models no more than 16-inch wide or less, down to 14-inch wide for the narrowest units, should be sufficient enough for small rooms. However, if height is your concern (low profile), you should check out our best low-profile window air conditioner list (where all models are under 12.5-inch high), but if width is what matters, check out our list of the best narrow casement window air conditioners. Back to this list: It includes some small air conditioners that have a standalone dehumidifier and a 24-hour on/off timer to save electricity. Some even have a remote control with a built-in thermostat display that gives you a temperature reading wherever you are in the room -- a feature normally associated with higher-priced air conditioners. All of the small air conditioners listed here are window-mounted models and designed for narrow windows. *Widths, on this list, are rounded for readability. 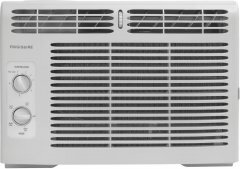 Considering this small window air conditioner's average rank of 80%, we believe that the Frigidaire FFRA0511U1 is currently Alphachooser's best small window air conditioner 2019. Furthermore, we think that our sample of 135 reviews from our sources gives us a high confidence level (more on confidence levels) that pushes us to call it a "no-brainer best choice." Measuring only 16 inches wide (most regularly-sized air conditioners measure more than 20 inches wide), the Frigidaire FFRE0533Q1 is a compact window-mounted air conditioner for the budget-cautious or those who simply need to cool a small space at home -- it is meant for rooms of up to 150 square feet, with its 5000 BTU. Most positive reviews (Our review crawler scanned a total of 933 reviews for this particular model at the time of writing) for this small air conditioner mention its appreciable energy-saving features, one of which its apparently-prompt Eco Mode, which essentially enables it to shut itself off automatically when the desired temperature level is reached and likewise turn itself back on to reach a certain temperature. It also reminds us of a few other small energy-efficient air conditioners with its favorably-high 11.2 energy efficiency ratio (EER) and rather budget-friendly 40-dollar Energy Star annual cost. Some users also noted the convenience of its full-function remote control, a facet that's obviously nice to have on a compact AC, despite being often overlooked when coming from much-larger units. Sadly, like a few other ACs of its kind, the 4-star FFRE0533Q1 suffered several negative reviews for its loud operation -- at least that's what some dissatisfied buyers say. That being said, the noise complaints range from makes a bit of noise when you are sitting near it, which is normal for most ACs, to extremely loud, so the verdict for this particular issue is still up in the air. 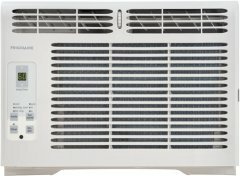 Knowing that our shopping algorithm crawled though a total of 8761 reviews for small window-mounted air conditioners, though, one verdict is for sure: The Frigidaire FFRE0533Q1 is among the top 7 small air conditioners on the market. 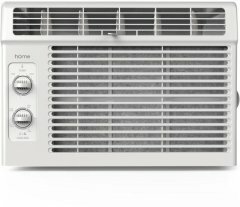 Measuring a mere 12 inches long by 16 inches wide, the 4-star hOmeLabs AC-188 is a compact air conditioner with a 5000 BTU rating, which translates to a maximum cooling coverage of up to 150 square feet -- most of its 338 reviewers have it running in one-bedroom or studio apartments that are within that range, with a couple of others using it to cool their RVs. Given its size, the AC-188 lacks a couple of perks that would otherwise be standard facets for mid-sized AC units, including a digital temperature readout (Its two physical knobs, as one satisfied reviewer puts it, could not be any simpler) and a full-function remote control. On the other hand, this small window-mounted unit's unobtrusive size has its merits as well, including a relatively quiet ambient noise and, more importantly, for one particular user, the absence of an annoying ratting sound that's somewhat typical of larger ACs. One pleased reviewer mentions that it's not as flimsy as a few other major-brand small ACs (most of which are also presented here at AlphaChooser), adding that its body does not feel that plastic-y . The same reviewer says that the AC-188 would be a perfect fit for a mid-sized studio apartment under northern climates, but cautioned that it only deflects air from left to right (no up-down deflection), which could be a problem for users who plan to install it onto a relatively low-rise window or AC slot. While some buyers call is a live-saver, though, the AC-188 does not please everyone (no air conditioner does), with several users protesting its operational noise. At the end of the day, given its assortment of user reviews, our shopping algorithm, which sampled 8761 reviews for AC units under this category, concludes that the hOmeLabs AC-188 is an Alphachooser good choice and, accordingly, belongs to the top 7 small window ACs. 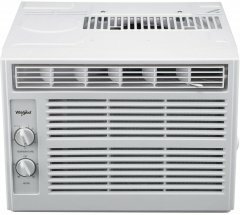 Designed to cool relatively small bedrooms of up to 150 square feet, the compact Frigidaire FFRA0511R1 comes with a 5000 BTU rating, a 1.1-pint-per-hour dehumidification rate, and a basic two-way air deflection system. Frigidaire also markets it as having a low-voltage start-up and a quiet operation, which are not very surprising facets in the world of small air conditioners. Also, it comes with a respectable energy efficiency ratio (EER) of 11.1 and a $41 annual cost. Some of its happiest reviewers go as far as saying that this 4-star low-profile AC is a great little unit, praising it for cooling a small home space as advertised. Several other users also mention its ease of installation, although it's probably safe to assume that one, given its 15-inch-only width. Some people also commended it for apparently not being too loud -- a window-mounted air condition that's small and noisy is a obviously a big no-no. Sadly, not all of its 5556 reviews were positive, with some cynical users complaining that this unit stopped working after just a couple of months and that it only blows cold air when turned up to the maximum setting. Speaking of settings, the FFRA0511R1 does not have a thermostat that displays the specific temperature. Instead, it comes with a 7-level cooling knob, 7 being the coolest setting. It also does away with a remote control, so you pretty much have to get up to adjust the temperature setting, although this is a rather forgivable setback, coming from a window AC tailored to tiny bedrooms and makeshift home office spaces. To rehash, after our review crawler scoured a total of 8761 reviews for ACs in this particular category, we can confidently say that the Frigidaire FFRA0511R1 deserves a spot in our hotlist of the top 7 small ACs on the market. 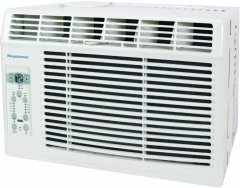 Designed to cool relatively small bedrooms or home spaces of up to 150 square feet, the 5000-BTU -- an unsurprising BTU rating for a small air conditioner -- Frigidaire FFRE0533S1 measures only roughly 16 inches wide and 12 inches long. It comes with a 4-way air deflection system and a dehumidification rate of up to 1.1 pints per hour. 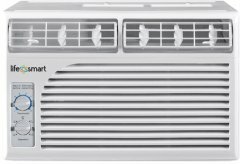 At the time of writing, this compact window-mounted AC unit averaged a rating of 4 stars from a total of 1096 user reviews. 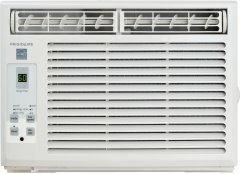 Like several other units in this AC category, efficiency is apparently the name of the game for the FFRE0533S1, seeing that it scores a favorably-high 12.2 EER or energy efficiency ratio (Some of its contemporaries only have around 10-11 EERs) and a 37-dollar energy star annual cost, the latter of which could make it a reasonable choice for the budget-cautious. This small energy-efficient air conditioner also comes with a low-power startup (at least according to Amazon) and has a timer function, in case you don't want it running all night. Some users also loved its full-function remote control, which is obviously a nice touch, coming from a compact AC. On the flip side, a few reviewers gave it dismal scores of only 1 or 2 stars, cautioning that this Frigidaire model may not be the best fit for light sleepers, with some users noting that it was among the noisiest ACs out there. Having said that, a few other users mentioned that, for its size, it gives off an acceptable amount of noise, so there are two sides of this coin. 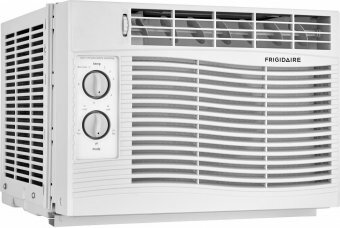 With all that said, our comprehensive review crawler, which rummaged through 8761 reviews for small air conditioners, determined that the Frigidaire FFRE0533S1 nevertheless merits a spot in our list of the top 7 compact ACs.